If you are searching for French Riviera Hotels then arriving on the Cote D’Azur, Nice will probably be your first point of call. Nice is a large city and often referred to as the Queen of the Riviera. It has hundreds of hotels and restaurants and you can find accommodation to suit all budgets in Nice. Due to the vast variety of hotels available, the good transport infrastructure and the close proximity to other major French Riviera resorts, Nice can be an ideal place to stay. Cannes is the next large Riviera resort. Both Nice and Cannes have excellent public transport systems and are on the main coastal rail line which runs from St Raphael to Monaco. From Nice you can also catch the bus 100 which takes you along the lower corniche road. At the last check, the cost was a mere 1.50 euros! From the lower corniche road you will get magnificent views across the bay at Villefranche and of course the approach to Monaco and Monte Carlo. Cannes lies slightly more to the West and is nearer to St Tropez. Like Nice, there is easy access to all the resorts from St Raphael to Monaco although of course the journey to Monaco in the East will take slightly longer. If your plan is a series of day trips then Nice is probably the best option and an added bonus is that it’s next door to the main airport of the area – Nice Cote D’Azur. Please see our page on French Riviera Sightseeing for more information on day trips. In terms of accommodation then Nice has hundreds of hotels and you can find accommodation to suit all budgets. Our page at Hotels in Nice France will give more information. In addition to a wide selection of hotels, Nice also has hundreds of restaurants and boasts a marvellous old town and flower market which provide an ideal outdoor eating experience during the hot summer evenings. The main pedestrian area has one restaurant after another and if you like Italian food, you will be spoilt for choice although of course there are restaurants to suit every taste. If you are planning to hire a car then Nice has plenty of car rental agencies although beware that it’s very difficult to find a parking place on the narrow one way streets of Nice and you can spend ages driving around trying to find a parking spot during the summer months. The rental agencies normally arrange for you to pick up the car from one of the main car parks in Nice. Not being able to find easy parking on the streets, you may well end up having pay for expensive car parking fees during your stay. Having said all this, having a car does allow to get to some of the more remote beaches and Capes of The French Riviera and if you can face the summer traffic jams, it will allow you to get to St Tropez which is not easy to get to and has no railway station near. With regards to St Tropez, you can catch a tourist boat from Nice or Cannes to St Tropez which will give you about 5 hours to look around the resort but this will probably not give you enough time to visit the famous beaches of the Pampelonne which are some 4 miles outside of the resort in the district of Ramutelle. Much of what is said about Nice, also applies to Cannes although hotels can be slightly more expensive in Cannes which although a large resort, is not a large city like Nice. Indeed Nice has everything which goes with a city, traffic, noise and busy shopping areas. Having said this, it does have the marvellous Promenade des Anglais, the old town and pedestrian areas where you can stroll and enjoy the atmosphere. Cannes as you would expect is a more glitzy resort where you can dress up during the evenings and be seen strolling along the famous Croisette and walking past the glorious Carlton Hotel. Indeed, the Croisette is a wonderful place to be in the evenings with it’s many restaurants facing the sea. 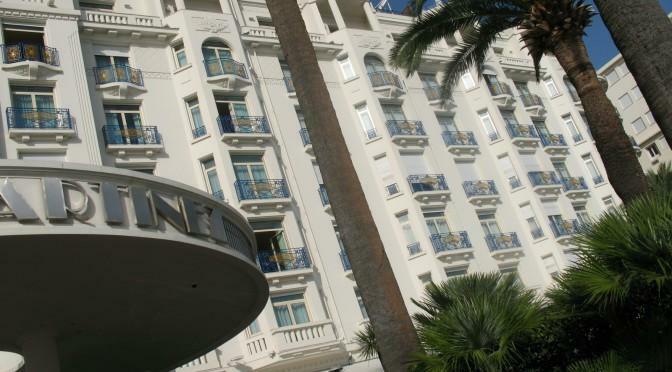 Why not treat yourself and stay at the glorious Hotel Martinez located on the seafront at Cannes. You will of course also want to spend a day or two in Nice or Cannes and have a break from excursions. In Cannes you will find Rue d’Antibes with all it’s designer shops and department stores. In Nice you will find large shopping centres and all the recognisable shops. If you like to swim and enjoy the beach, you should be aware that Nice has a pebble beach whereas, Cannes has a sandy beach. Please see our pages on French Riviera Beaches. If you want to experience a smaller resort to use as a base then Antibes or Juan les Pins would be good options. There is a land train which connects both resorts and there is easy access to all the main Riviera resorts. Don’t rule out Monaco as your base. Despite what you think, you can find reasonable priced hotels in Monaco and eating out need be no more expensive than Nice or Cannes. You also have the advantage of staying is breath taking surroundings and also being within easy reach of Italy. We hoped this has helped with your decision of where to stay on the French Riviera. Nice is that major airport for the French Riviera and is a great place for shopping or eating out. You may be surprised that the beach is not golden sands but comprises of large pebbles. However, people seem to get used to this quickly and spread their towels out over the pebbles. There are of course plenty of private beaches along the Promenade where you will see rows of loungers with blue and white striped mattresses. Here you can also get lunch and in the evenings you will often find entertainment and live music. You will find hundreds of hotels in Nice including the Hotel Negresco which is one of the most stylish and elegant hotels on the Riviera. For shops you will find the Avenue Jean Medecin a good place to start. You will also find the old town full of quaint shops and places to get your souvenirs. It is advisable to assume that any mention of a product or service on this website (frenchrivieravisitor.com) is made because there exists, unless otherwise stated, a material connection between the product or service owners and this website and should you make a purchase of a product or service described here the owner of this website may be compensated. In no event will I/we/frenchrivieravisitor.com be liable for any loss or damage including without limitation, indirect or consequential loss or damage, or any loss or damage whatsoever arising from the loss of data or profits arising out of, or in connection with, the use of this website. Through this website you will be able to link to other websites which are not under the control of FrenchRivieraVisitor.com. We have no control over the nature, content and availability of those sites. The inclusion of any links does not necessarily imply a recommendation or endorse the views expressed within them. All photographs on this site are the property of FrenchRivieraVisitor and cannot be copied or used elsewhere.